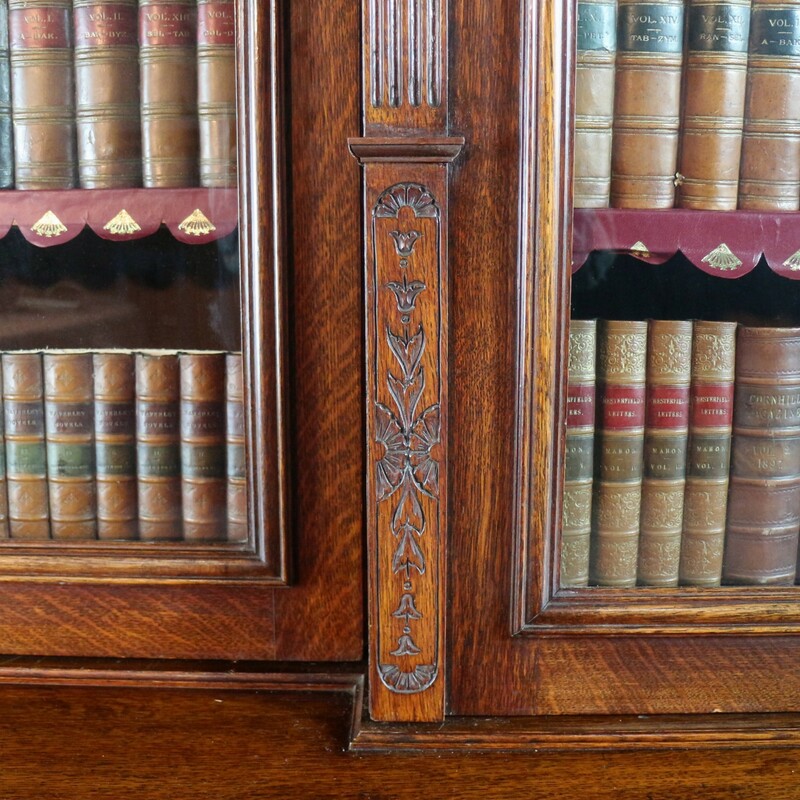 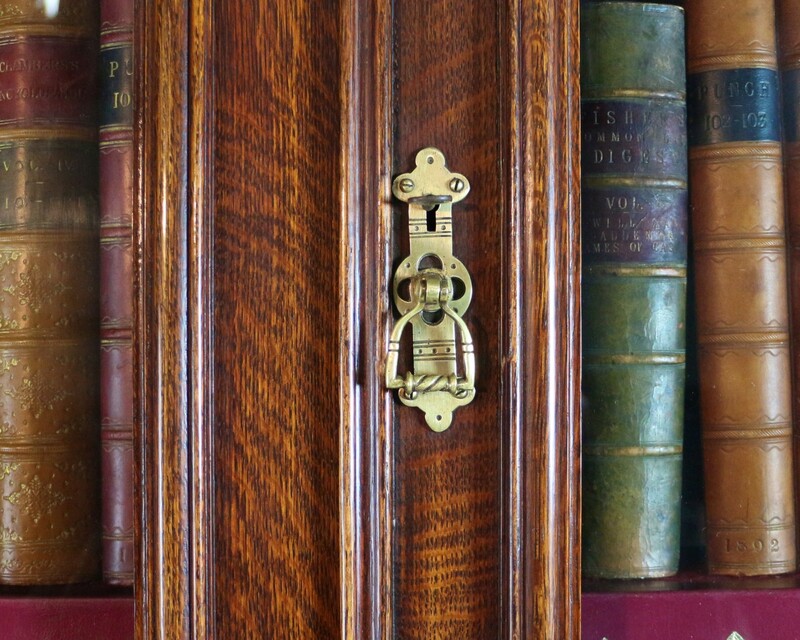 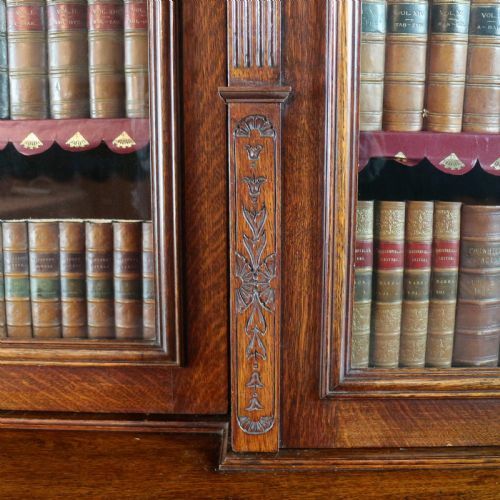 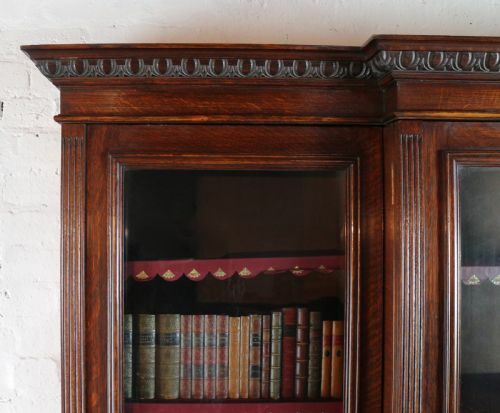 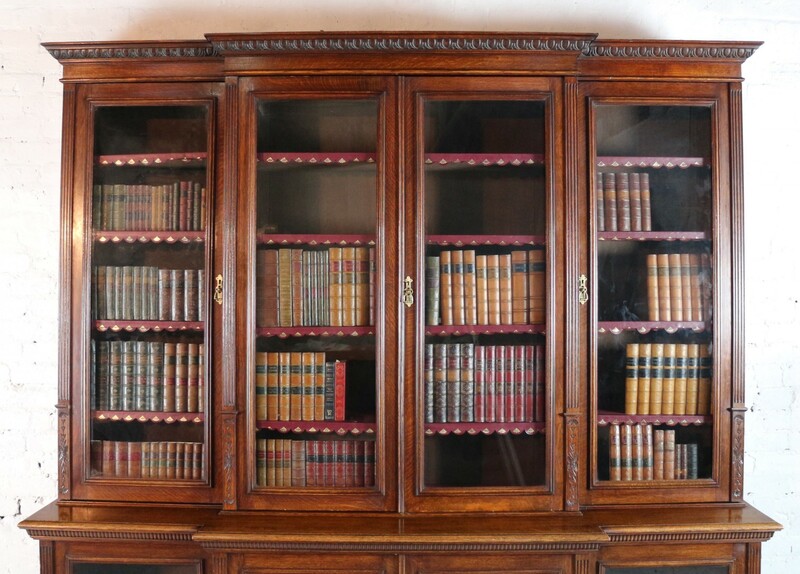 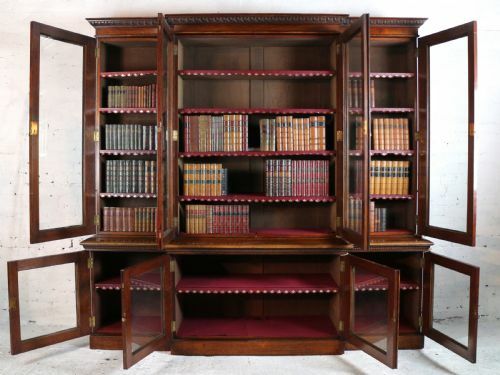 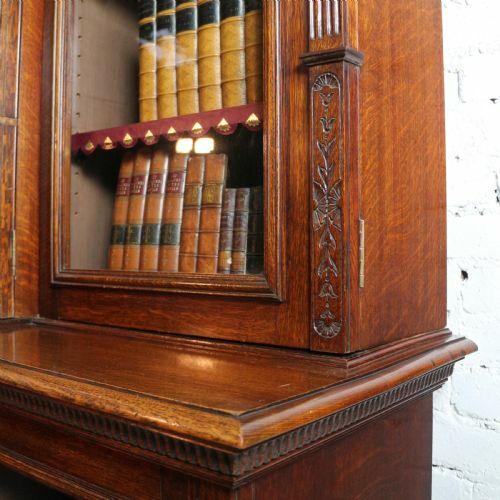 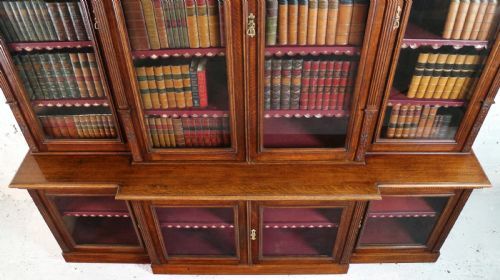 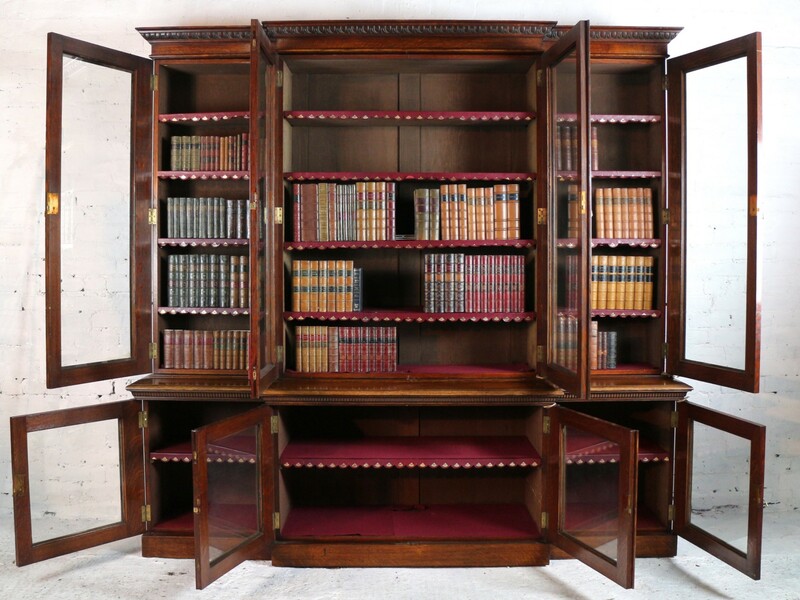 A super Victorian four door breakfront bookcase attributed to Maple & Co of London and previously owned by Mario Conti (Bishop of Aberdeen 1977-2002 and Archbishop of Glasgow 2002-2012). 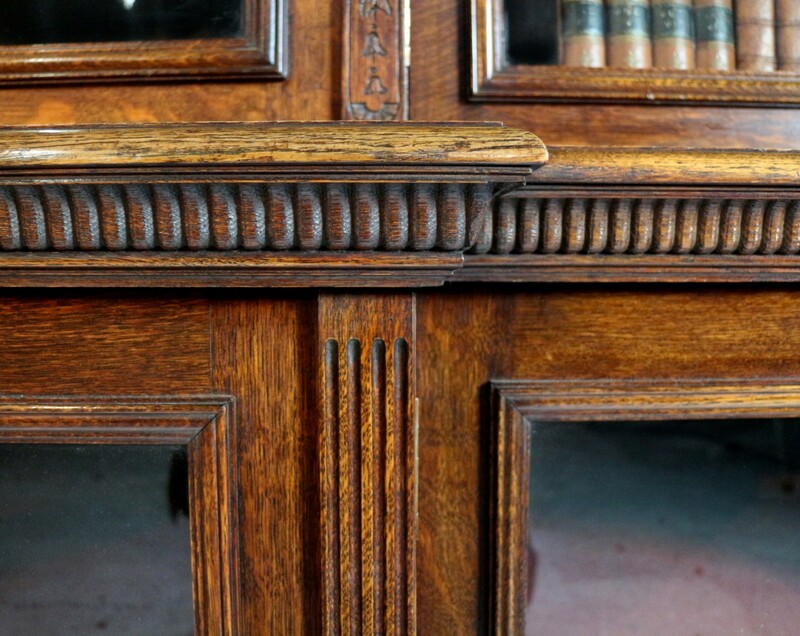 Dating to c.1880 and designed in the Aesthetic taste in quarter sawn oak it features a stylised egg & dart cornice and foliate carved emblems and fluting to the uprights along with typically Arts & Crafts brass handles. 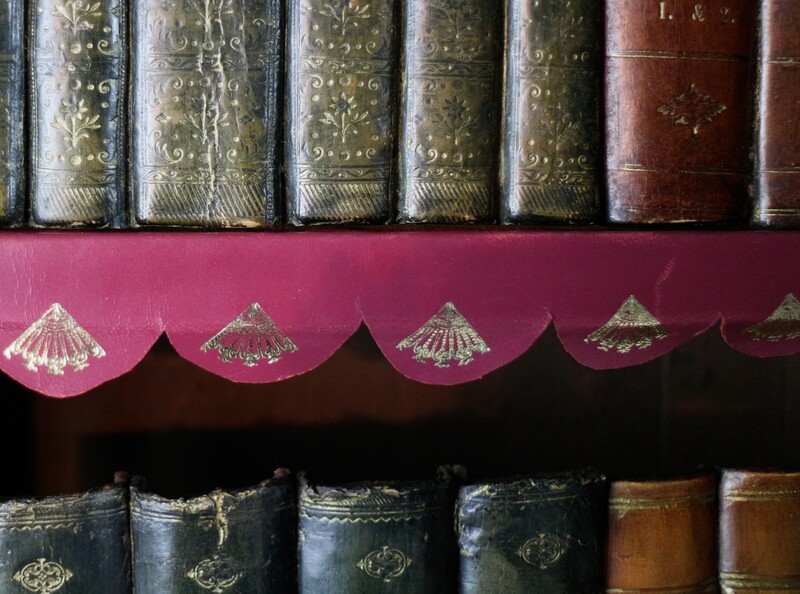 With twelve original adjustable shelves to the upper section, the shelves are nicely finished with burgundy and gilt embossed leather skirts and a red baize top, the stepped out base has a fixed baize lined shelf to each section. 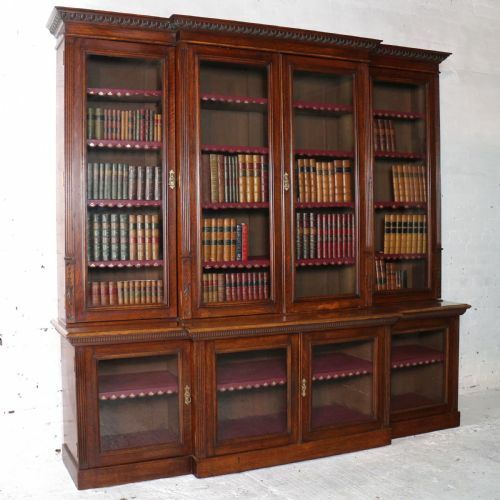 Overall this bookcase will store just over 53ft (16.2m) of books. 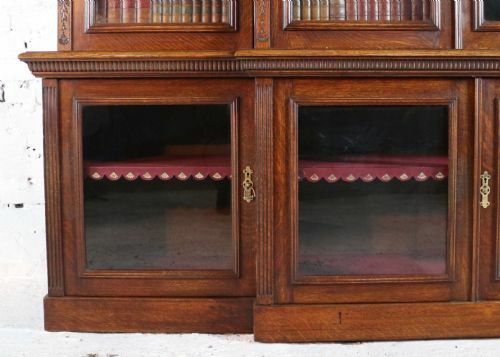 In very good condition overall, some marks as should be expected for age and use and some small bits of moulding missing from front uprights, one handle drop is missing (we will find a replacement), comes with two keys which open all doors except the base left and base centre doors, baize worn in places. For moving this bookcase is designed to be split into five sections with the cornice lifting off, the upper part dividing into three sections leaving the base as one part. 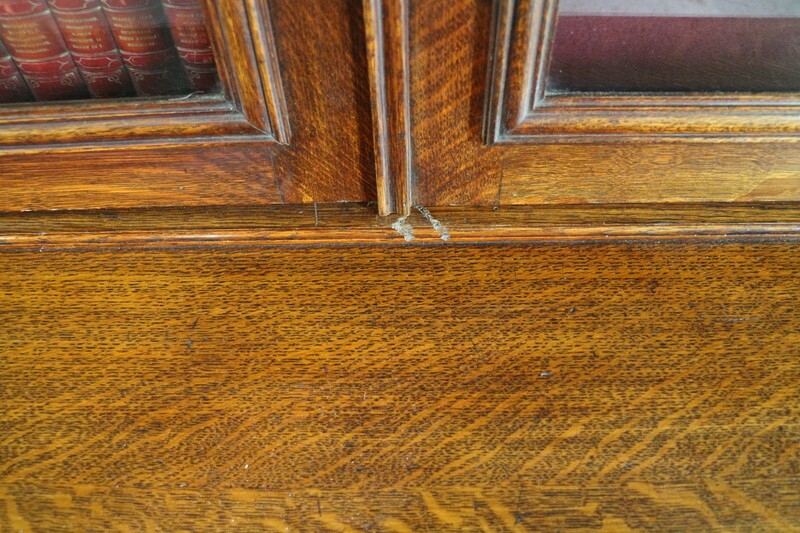 These sections should all be screwed together when assembled. 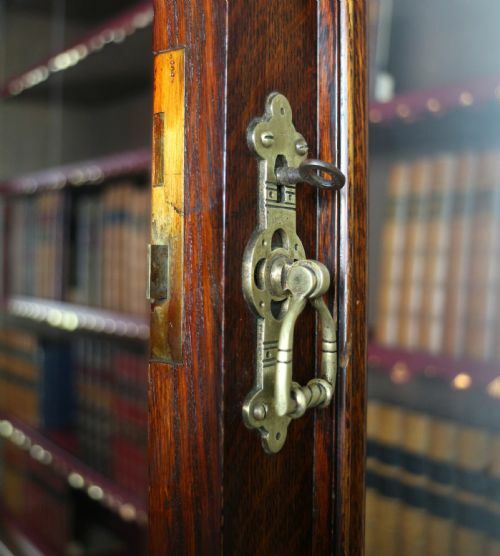 Provenance: Mario Conti, Bishop of Aberdeen 1977-2002 and Archbishop of Glasgow 2002-2012. 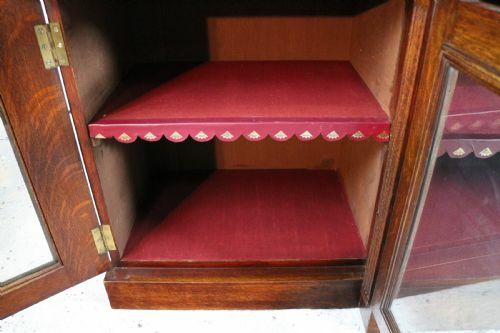 Please feel free to contact us for more information or photos, we have many more photos on file for each item but can only upload a limited number. 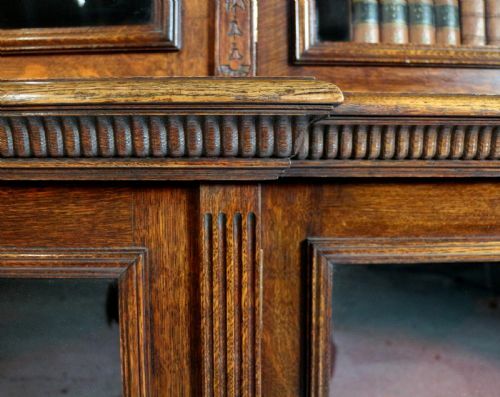 When buying it is important appreciate antiques have long histories of daily use and as such, over time they gain minor scratches, marks, knocks, shrinkage splits, signs of old woodworm, lifts and losses to veneer, which combine with care and years of polishing to create an individual character and patina. 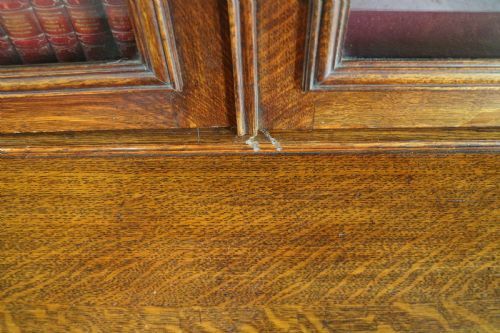 We describe the main flaws and those that fall outside of this bracket but cannot describe each marks separately and therefore suggest you do take the time to request extra photos. 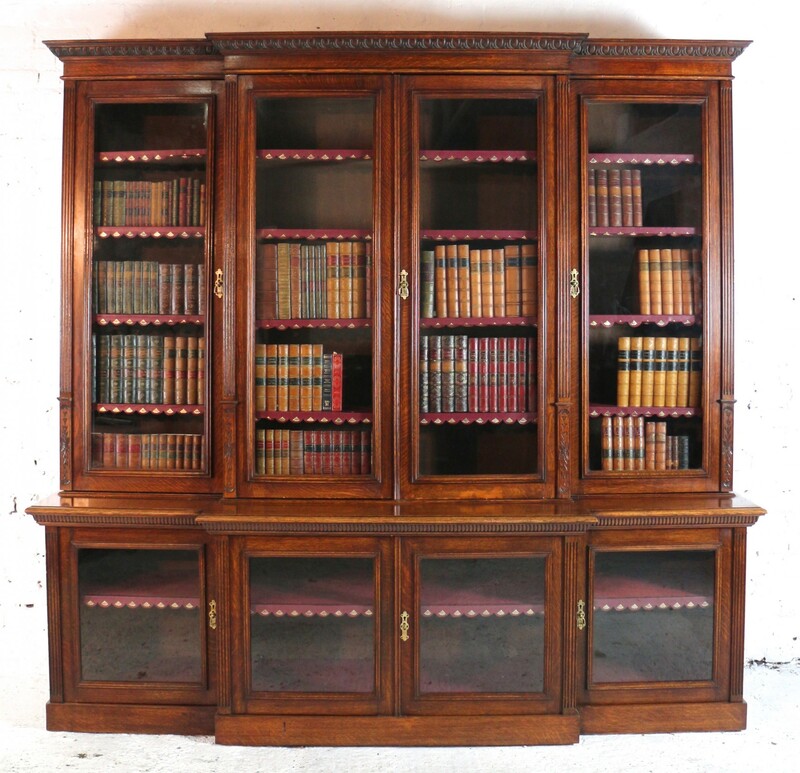 We do offer a 14 day money back guarantee if you are unhappy with your purchase but cannot refund the return shipping cost. If you are not sure please do not buy without clarifying or take the view that the only way to have it as near to new as possible is to have it fully and comprehensively restored. 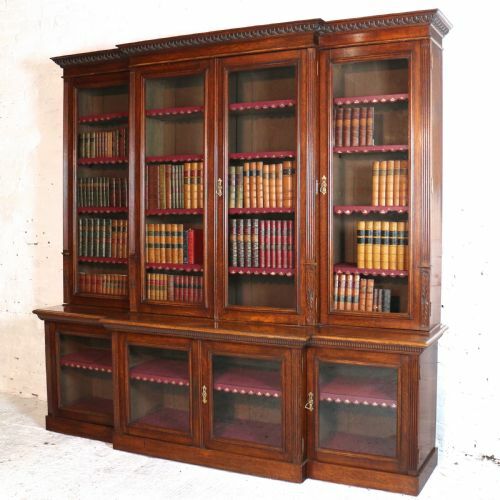 For delivery we use a small carrier experience in carrying antique furniture. 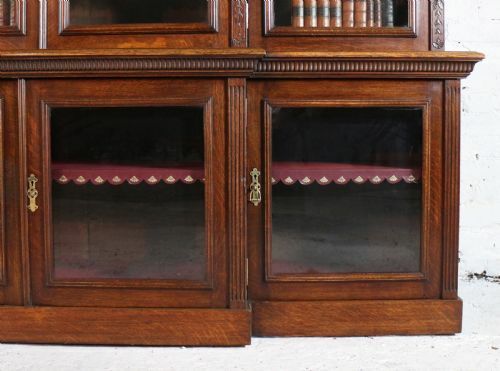 Delivery is usually within 31 days and the carrier will make arrangements with you directly. 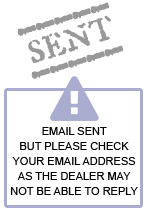 We can provide contact details of other carriers if required. 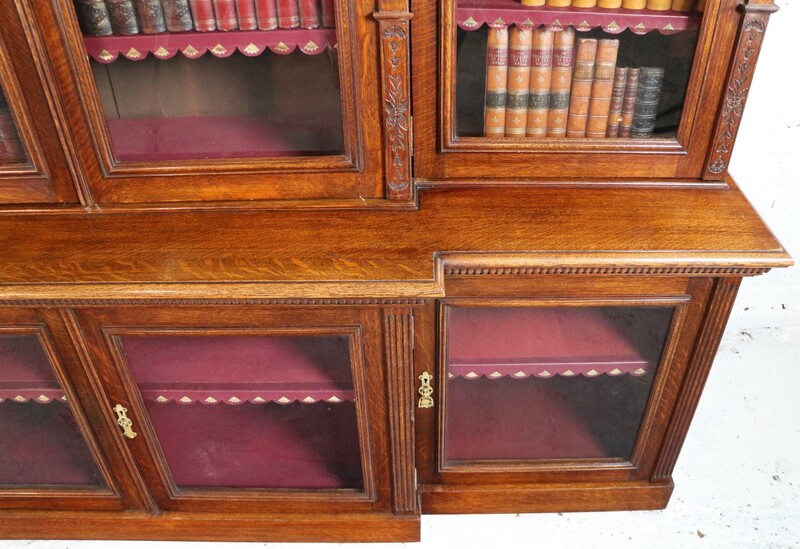 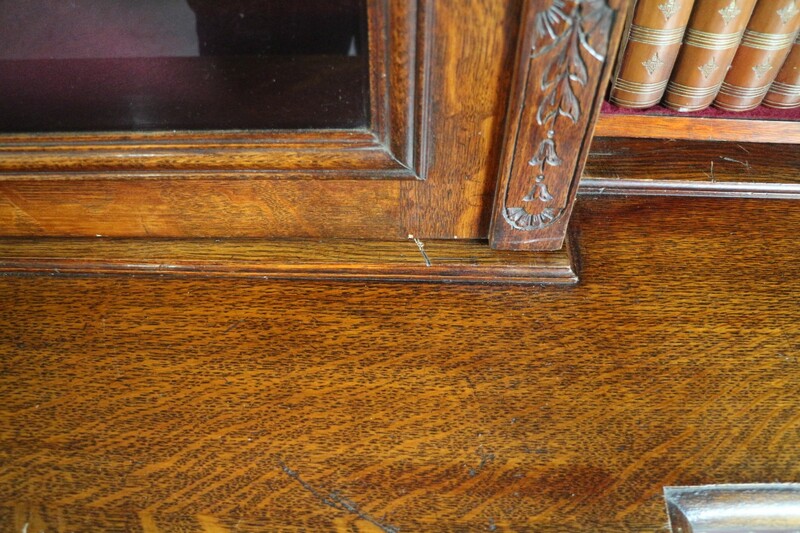 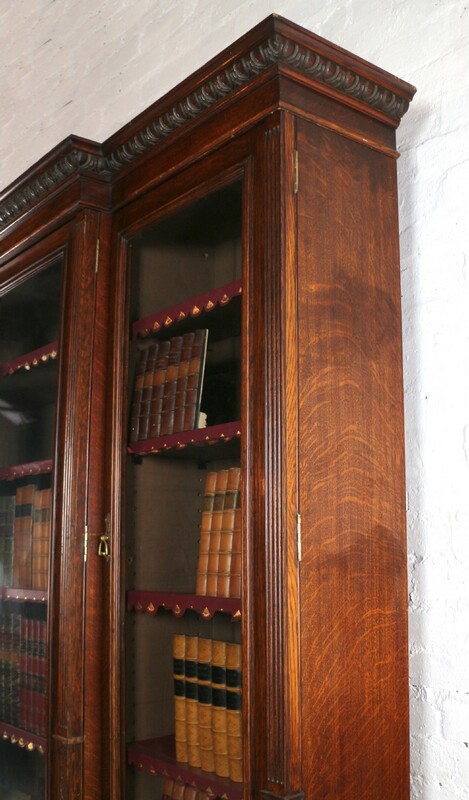 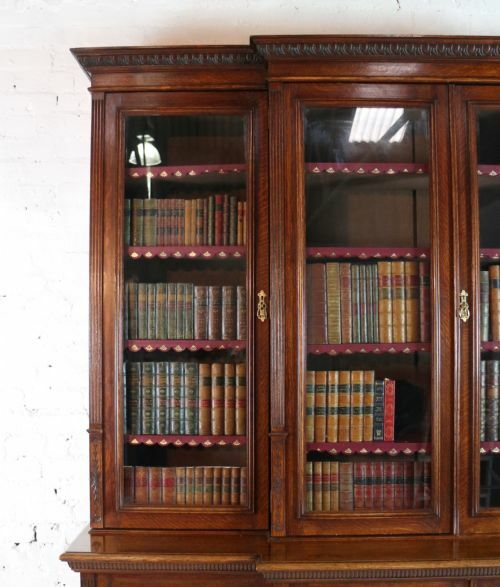 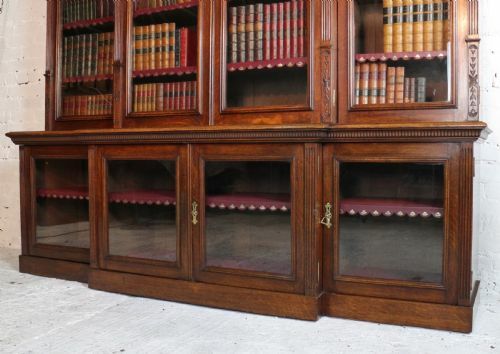 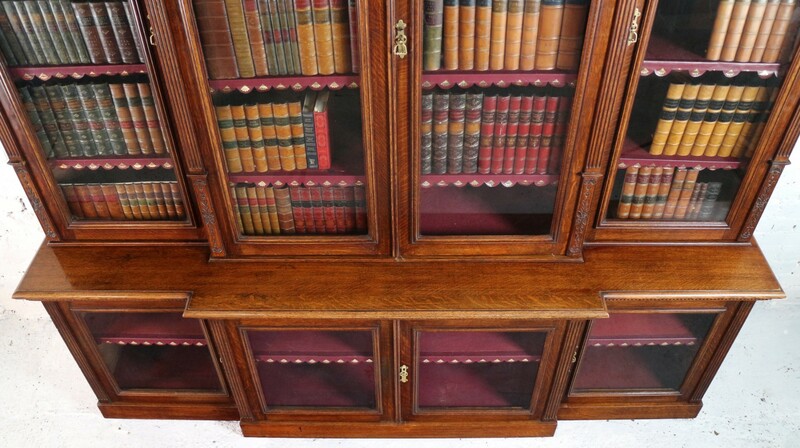 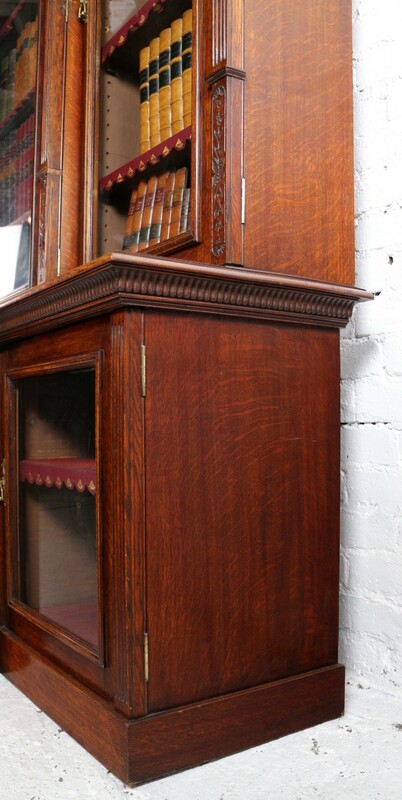 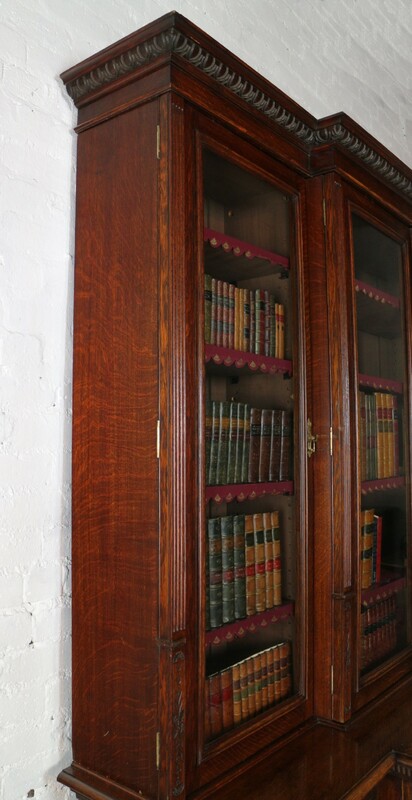 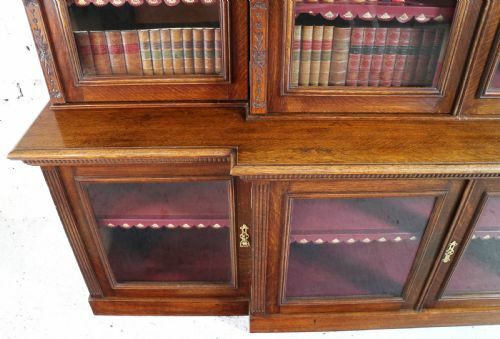 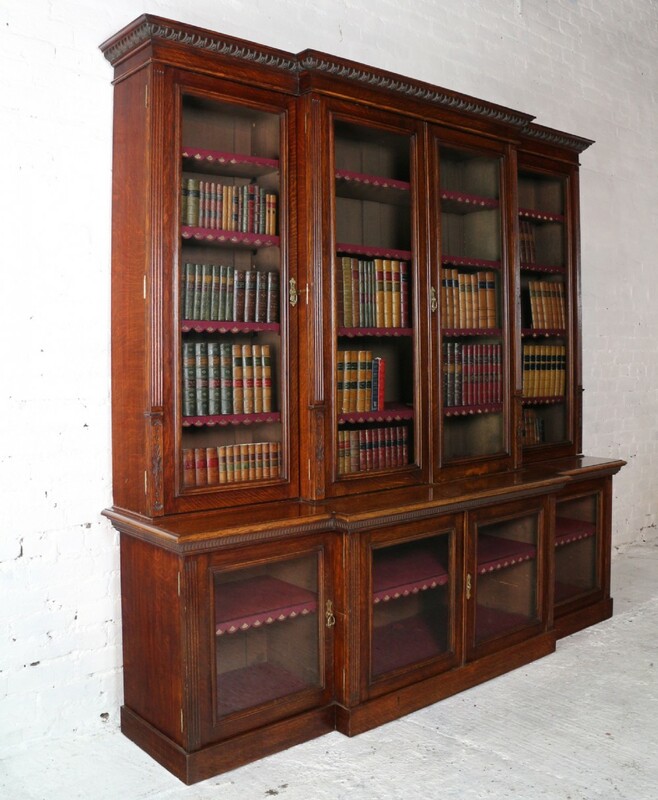 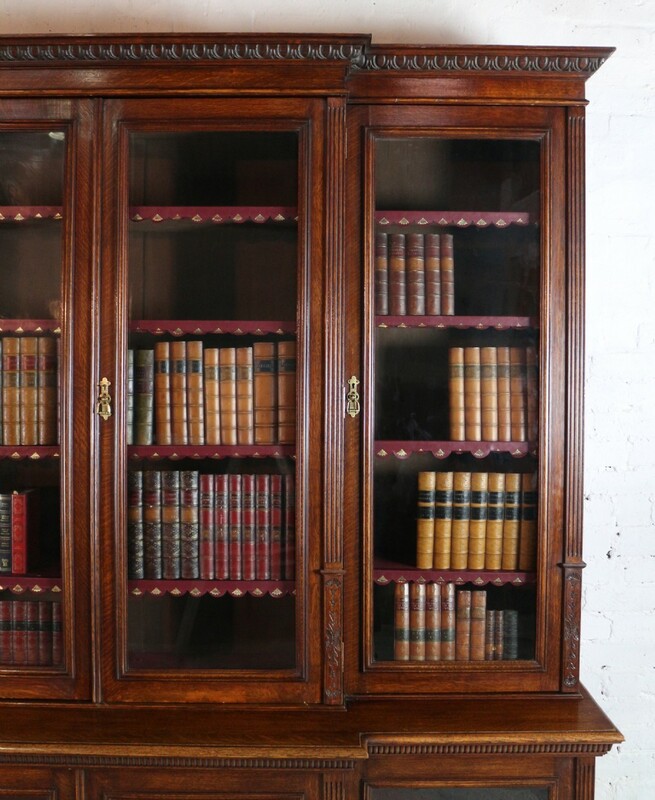 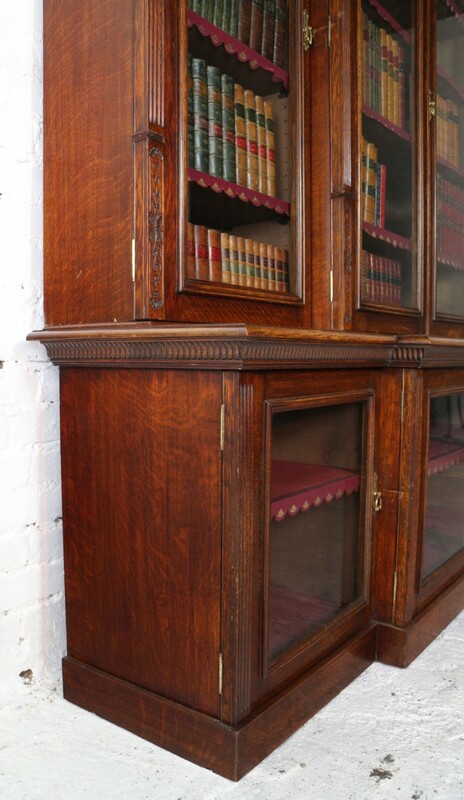 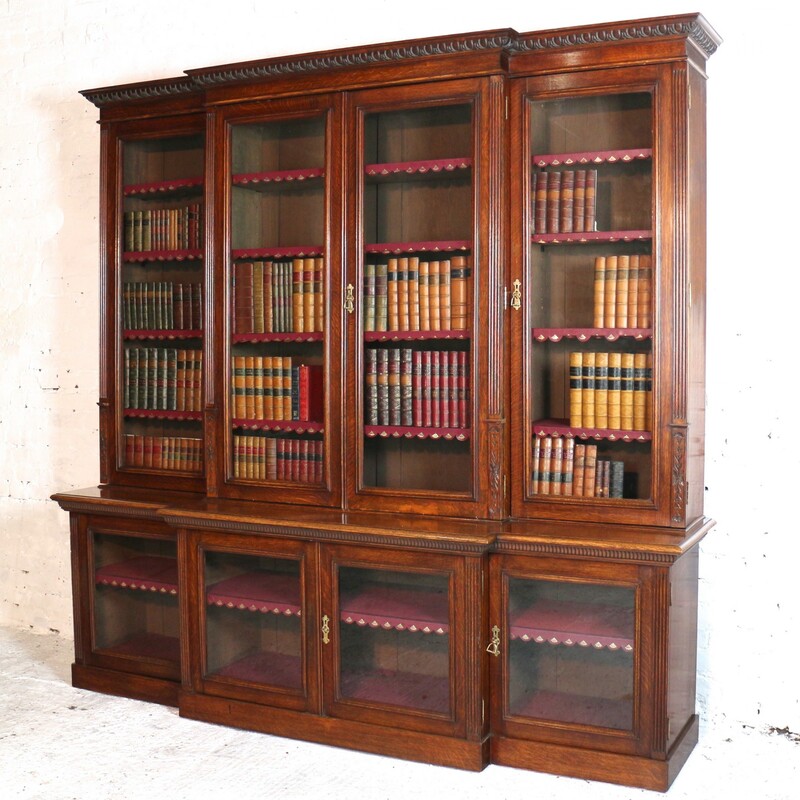 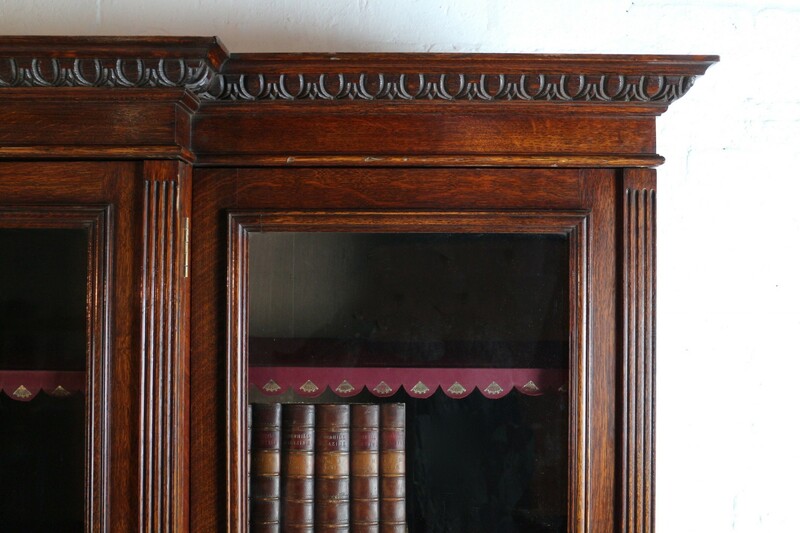 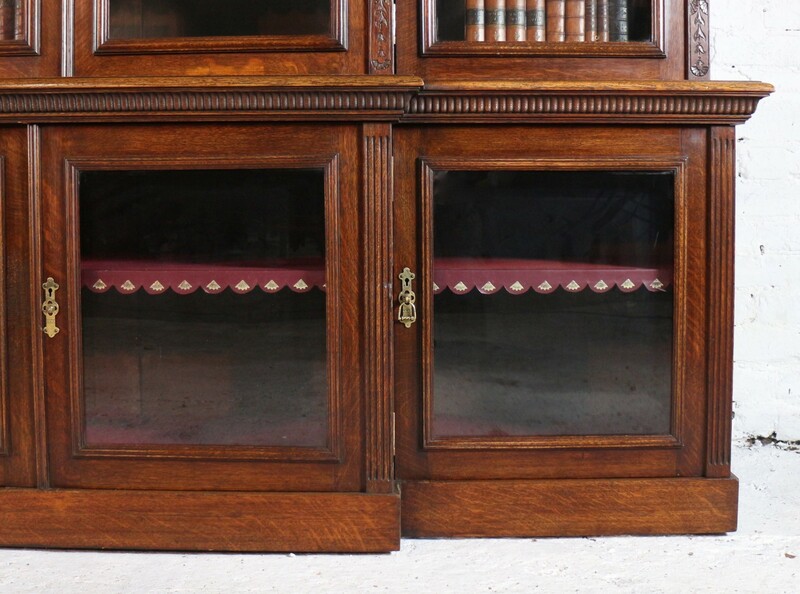 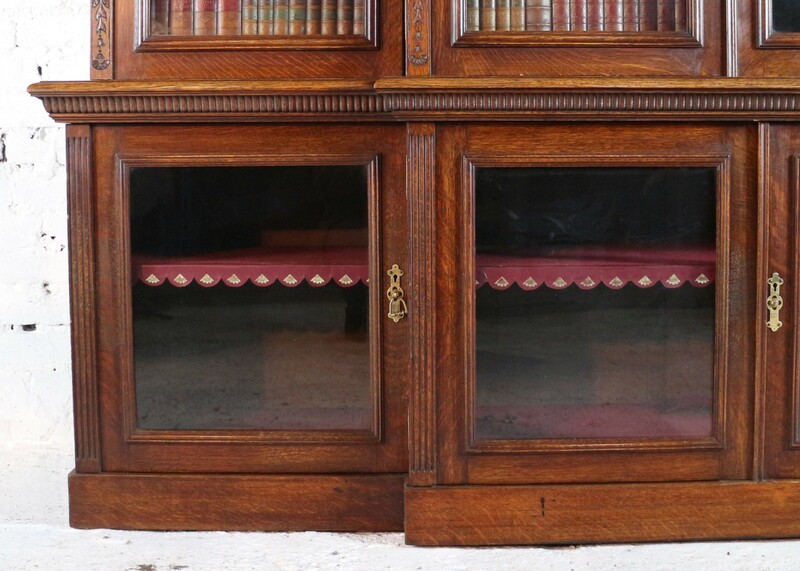 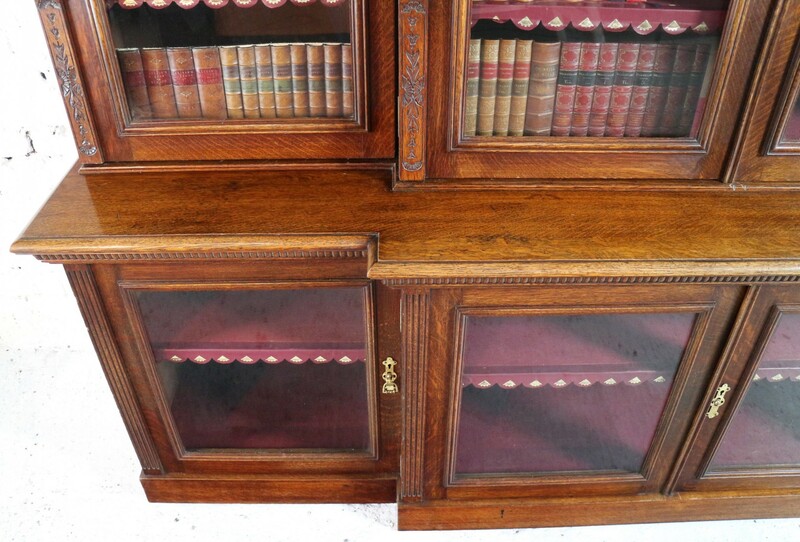 The Large Victorian Oak Breakfront Bookcase, attributed to Maple & Co has been added to your saved items.